This impressive condominium is a penthouse corner unit with fantastic panoramic South/South West views. 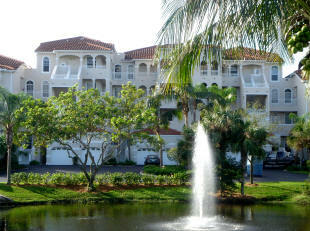 The enclosed lanai overlooks two lakes and the beautifully landscaped Pelican Marsh Golf course. The condo has spectacular views from each room, massive 14-foot ceilings in the Great Room and Dining Room, and approximately 1900 sq feet of living area all on one floor. All new furnishings have been placed throughout the condo, providing an elegant/casual look. The condominium has 3 bedrooms that can sleep 6 people comfortably. The spacious Master bedroom has a king size bed and an immense walk-in closet. The second and third bedrooms contain a queen bed and two twin beds respectively. Each bedroom has furnishings for storage, cable television, and sitting/reading areas. The large Master bathroom is directly located off the Master bedroom. It includes separate shower & tub amenities plus double sinks. The second bath is a full-size bathroom. The large kitchen has dishes, cookware, utensils, dishwasher, refrigerator w/ice maker, a microwave, a toaster, coffee maker and a disposal. The condo has a two-car garage, with an elevator from the garage to the condo level. Additional amenities include: Wireless Internet access, HDTV's and HDTV cable, VCR/DVD/CD player, linens, washer & dryer, iron & ironing board, and 3 phones. The Clermont includes: 9 tennis courts and a pro shop w/ lessons available, a swimming pool and spa, and 2 workout facilities. Nearby activities include: golf, shopping, restaurants, art galleries, cinemas, casino gambling, various church congregations, and Gulf activities like: ocean swimming, strolling on the beach, boating, fishing, etc.